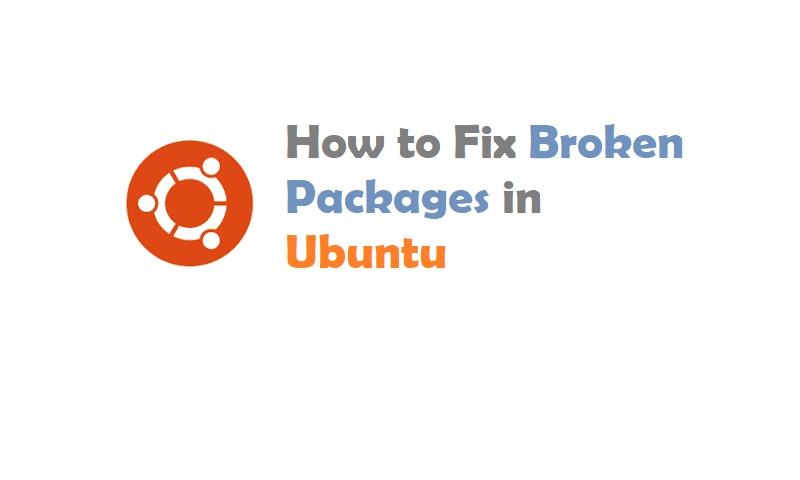 In This article, We talk about “How to Fix Broken Packages in Ubuntu”. Apt, Ubuntu’s package manager, The apt command is a powerful command-line tool, which works with Ubuntu’s Advanced Packaging Tool (APT) performing such functions as installation of new software packages, upgrade of existing software packages, updating of the package list index, and even upgrading the entire Ubuntu system. Also, adding the –purge option to apt remove will remove the package configuration files as well. This may or may not be the desired effect, so use with caution. For information on upgrading to a new Ubuntu release see Upgrading. Actions of the apt command, such as installation and removal of packages, are logged in the /var/log/dpkg.log log file. Apt has a couple of flags that you can use in order to fix missing dependencies or packages that broke for one reason or another during install. A common use here would be installing a third-party .deb and finding that it had dependencies you didn’t know about. Those dependencies probably won’t be pulled in on their own, and dpkg will complain that the package is missing in them. You can try these steps. First, run an update to make sure that there aren’t newer versions of the required packages. Next, you can try forcing Apt to look for and correct any missing dependencies or broken packages. This will actually install any missing packages and repair existing installs. Another place where error can pop up in package installations is the configuration process. Behind the scenes, dpkg is taking care of this part, not Apt, so it would stand to reason that when a package fails during configuration, dpkg is the tool to turn to in order to fix it. Start by trying to force dpkg to reconfigure any broken or partially configured packages. If that doesn’t solve the problem, you can take a more forceful approach. Start by listing any packages that dpkg marked as requiring a reinstall. You should see the problematic package(s) there. As long as there’s nothing that seems not to belong there, you can force-remove the broken packages. When dpkg is done, try to clean up with Apt. With any luck that’ll get you back to where you started. It won’t get you the broken packages that you tried to install, but at least Apt will be functional again. There’s a less common issue with ridiculous dpkg locks preventing you from doing anything. Every time you try to use Apt or dpkg, you get an error saying another application already is … when it isn’t. It’s actually easy to delete the lock file preventing you from using Apt and get back to doing what you need to. Sometimes these lock files remain in place after an error occurs in an install, derailing the process and preventing the file from being removed automatically. For good measure, delete the lock in cache. Ubuntu Software Center Not Working? You can chain these commands using the && syntax. If the above doesn’t work, then you may need to reinstall Gnome-Software. This should pull down the latest version of Ubuntu which should fix the issue. This will pull a clean package list to your machine and should allow you to install software via the search. Sometimes the Software Center crashes when entering categories. Usually this can be resolved by running the update commands as shown earlier in the article or by reinstalling as before. I hope you like this post “How to Fix Broken Packages in Ubuntu”. Do you have any questions? Leave a comment down below! Thanks for reading. If you like this post probably you might like my next ones, so please support me by subscribing my blog. InfluxDB | Installation | How To Use | Time Series Database ? Remote control your Raspberry Pi from your PC with VNC!